useful energy through heat recovery! Our systems for heat recovery are used worldwide by customers from a wide variety of industries. Customers not only reduce their energy costs, but also make a significant contribution to environmental protection. Inform also you free of charge and witthout obligation about possibilities for the waste heat use in your enterprise! In almost every industrial company waste heat is available for further use! For example from the compressed air production, from cooling water or most diverse heat-technical processes. 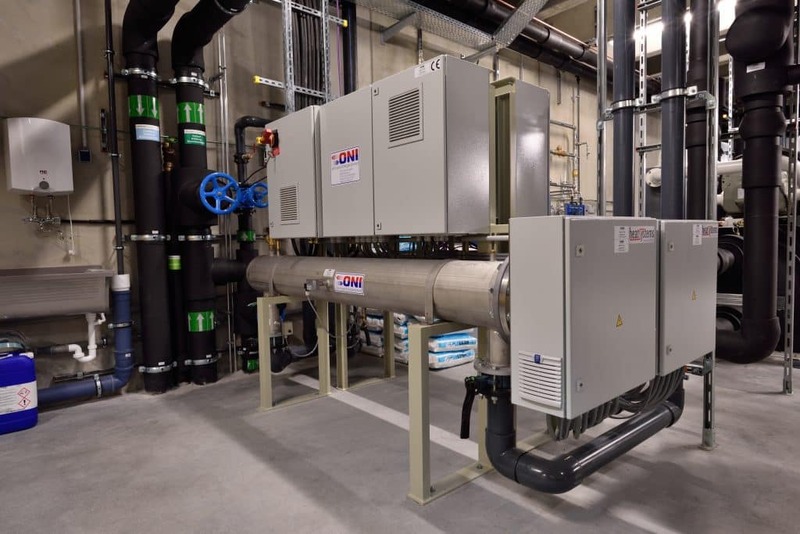 Even waste heat from cooling water with a temperature level of 35 °C can be used ideally for the heating of offices, social rooms and workshops by using our heat recovery systems. With this system technology, once paid energy is not only used once but at least twice or even three times. Particularly in energy-intensive operations, where processes and machines are cooled, hardening and annealing furnaces or melting plants are operated, there are ideal starting points for the use of heat recovery ....provided that there is a need for heating energy or process heat and this energy must previously be generated via expensive primary energy. The investment costs for a central heating system with boilers, burners and chimney system are considerable! Here not only the costs for the system elements have an impact, but also the necessary building substance. In addition, an entrepreneur would much prefer to use the space required for a central heating system with boilers for production machines and plants. We have implemented energy supply concepts for customers that do not require a boiler system! For example, for plastics processors who cover 90% or more of their heating requirements from waste heat from machines or processes. Only in times when no waste heat is available is a deficit heating provided by electric heating cartridges. This variant requires extremely little space, even at high outputs. Energy costs are becoming a problem that should not be underestimated, especially in energy-intensive companies. This cost factor therefore has an increasing impact on the competitiveness of companies. In the meantime, more and more companies are countering this development with an offensive energy-saving policy. For example through the multiple use of energy with the help of heat recovery. Such measures keep energy costs at a minimum level in the long term. In addition, heat recovery measures finance themselves in a very short time due to the sharp rise and further rise in energy prices. When such energy-saving measures are externally financed, for example by means of plant leasing, customers find that the savings are higher than the financing rate. Customers thus receive an energy-saving system without equity capital input, the financing rate is generated from the savings and the savings surplus can be used to purchase new production machines. Many plastic and metal processing companies could reduce their heating energy calculations to almost zero by using heat recovery! This system technology from ONI makes it possible for waste heat from production to be used for heating purposes. This technology is based on special heat exchangers developed by ONI which get by with a heating water temperature of only 35 °C. The heat exchangers are designed for the use in the production of heaters. Today, for example, series of heat recovery units are available which, despite the low level of heating water, are able to supply halls or offices with heating heat at an even temperature distribution. Waste heat sources for this type of heat recovery are usually sufficiently available, especially in plastic or metal processing companies. For example, from oil cooling on hydraulic units which generally manage with a flow temperature of 30 °C at a return temperature of 35 °C. The heat recovery system can be used for the cooling of the oil in hydraulic units. This type of heat recovery also has an extremely positive additional effect. Energy paid for once for the hydraulic drive is used a second time, via the cooling water system, for heating purposes and at the same time reduces the costs that would be necessary for the operation of a recooling plant. The use of heat recovery in industrial plants leads to a threefold use of electricity as drive energy! So waste heat, whose recooling costs money, is turned into heating energy that saves heating costs via ONI's heat recovery system!